2.4kg Chicken - Ranchmans Premium Dog Rolls have been formulated to meet your daily nutritional needs, in a wholesome, meaty and convenient way. These Dog rolls are shelf stable (no refrigeration required). Remember, dogs are carnivores (meat eaters) and in recent years the life expectancy of dogs has plummeted due to the misguided use of wheat based products and fillers. 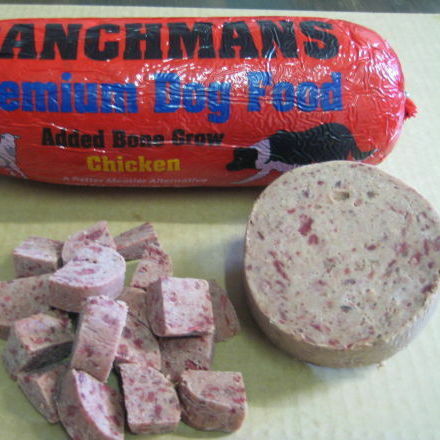 Ranchmans has produced its real meat roll for all dog types from the hill country working dogs (who need to remain strong and healthy with stamina to be able to sustain work) to the domestic pet (to keep them healthy and a shine on their coat). A good product means you feed them less to maintain health, and a healthy dog means fewer trips to the vet.